The Petroleum industry has a long history; in fact, the current Petroleum industry began in the United States over 150 years ago. The state of Texas is recognized to be at the center of the Petroleum business ever since oil was struck at Spindletop in 1901. Currently, Texas has nearly 50% of all US Petroleum drilling activity, with Petroleum (oil and/or gas) produced in over 80% of Texas counties. Like all industries and businesses, there are times of boom and bust. However workers can be insulated from some of the unpredictability of employment by earning a Petroleum Technology Associates Degree through Western Texas College. This Petroleum Technology Associates Degree program has courses designed to provide a wide range of education, exposure, and experience with the history, equipment, and many careers that comprise the Petroleum industry. The “oil ﬁeld” business is more than just drilling a well. For example, how do you know where to drill a successful well? How is the well prepared and ﬁnished? 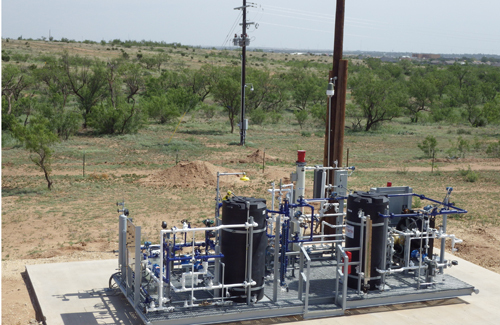 How are the products from a Petroleum ﬁeld produced and delivered to market? These questions and many more will be answered at Western Texas College. The Petroleum Technology program consists of classroom lectures, seminars, visits by and to mentors, ﬁeld site visits to applicable businesses, use of simulator software to illustrate principles, and use of equipment in a dedicated full scale oilﬁeld simulation laboratory. And during the ﬁnal semester of this two year program, serving in an internship program working in that sector of the Petroleum ﬁeld which most interests the student. Obtain a higher entry level of employment within the Petroleum industry. Advance beyond an entry-level position. Advancement will not be limited as it currently is for the roustabouts and derrick deck hands. Maintain employment, when the roustabouts are no longer needed. Help maintain production in this great State of Texas where there is one well for every 26 residents (there are nearly 1 million Petroleum product producing wells). Aid the U.S.A. in becoming free from reliance upon foreign oil. Begin employment within the Petroleum industry with a beginning salary in the range of $60,000 USD (data from multiple major employers).